My Mom, Estelle Kreinik, was not only a great stitcher and knitter, but she taught me that making a pie was easy. Today, I make this pie, a family favorite, for all family celebrations and parties. It is a simple, fast, and fail-proof Pecan Pie that I have used as a base to experiment in creating excellent alternatives to traditional Pecan Pie. Using the same ratios, I have made Walnut Pie (which my Dad loved) and Oatmeal Pie (which my wife and I first tasted in a little restaurant in Cheraw, South Carolina). One of the regular enhancements to this recipe was the addition of cocoa, which I decided to use as an alternative to dark chocolate chips. Also, let it be noted that I am lactose intolerant, as was my Mom. This pie calls for no butter or milk. After 10 minutes, turn down oven to 350 F (177C) and bake for 1/2 hour. Instead of pecans you can use any type of nuts, such as walnuts or for those allergic to nuts use 2/3 cup (159 gm) of uncooked oatmeal. NASA just launched a rocket to the moon. Yale University found a new star, the bouncing baby Herbig-Haro 46/47. "Star Trek Into Darkness" came out on Blu-ray this week while we await the new Star Wars movie. Jane Lynch just got her star on the Hollywood Walk of Fame, and the new cast has been named to the next Dancing With The Stars. Stars are everywhere, and they will never go out of style in needlework, crafts, and life. So this week's blog shows you five ways to make your stitched stars sparkle like the real things. 1. Use a metallic thread. Look into the night sky. It isn't matte, all-one-color, or boring. Some stars shimmer, some are brighter than others, far away, or nearby. The night sky has depth, variations of light, shading, and excitement. Your stitched night sky should be the same. There is no reason to have a boring night scene when metallic threads are available. Kreinik metallics are designed to be easy (no need to ply, just use it straight off the spool), soft (most are polyester blends), and versatile (use them in many different stitches, on many types of fabrics). The color range is such that you can even do shading among, for instance, silver metallic colors: a darker silver like 025 Gray will make a star look farther away, an 001 Silver would be mid-range, while a brighter 001HL Silver Hi Lustre star would appear closer. There is so much fun you can have with metallic threads in your stars—dare we say it, "the sky's the limit." 2. Use a holographic thread. Stare at a bright star for a moment, and it will twinkle, maybe alternating blue and white. Sometimes we think our eyes are deceiving us when it comes to the colors of stars. While there are scientific explanations, it's also part of the magic of star-gazing. Holographic threads are perfect for replicating this twinkling effect because they are iridescent threads with flecks of different colors built right in. Kreinik's line includes Braids, Ribbons, and Blending Filament, so choose the size according to the fabric you are using (see #3 below). The best star colors include 001L Solar Silver and 002L Chromo Gold. You can use Kreinik holographic threads in any stitch (cross stitch, tent, eyelets, etc). No need to separate plies or combine strands, just use it straight off the spool, as it comes (easy!). You or your children may have had them: glow-in-the-dark star and planet stickers on your ceiling. Anything glow-in-the-dark is fun; the little surprise when lights go out is just about as delightful as it gets. So one of the easiest ways to make your stitched stars light up is to use a glow-in-the-dark thread. Kreinik offers several colors, but 052F Grapefruit or 054F Lemon-Lime are the most popular for star colors. Choose the Kreinik Braid size depending on your ground fabric. For instance, use Fine #8 Braid or Tapestry #12 Braid on 18-mesh needlepoint canvas, or Heavy #32 Braid on 10-mesh canvas. For cross stitching, choose Blending Filament for the most subtle effect, Very Fine #4 Braid on 16-count or 18-count (or over two on linens), and Fine #8 Braid on 14-count. A wired thread will really make your star stand out. Kreinik's version is a metallic thread with a wire in it, making it shimmer and glisten. Glow-in-the-dark colors are even available in the Wired Braid™ line. In our sample, we tent-stitched the background first, formed a similar color of Kreinik Wired Braid™ into the star shape, then tacked it on top. The result is a layered, 3-D effect. This technique would be fun for stitching shooting stars that look like they are flying right off your fabric (or making fireworks in other night-sky-themed designs). 5. Try a reflective thread. We came out with this Reflective Yarn for the knitting and crochet market, as a way to add reflective quality to hats, scarves, dog sweaters, gloves, etc. However, you can stitch with it too. Although it looks like a plain, matte gray sewing thread, it is made up of tiny glass beads which reflect light. Use it just like you would a Kreinik Braid, straight off the spool. It works in cross stitch, eyelets, and many "star-like" stitches. 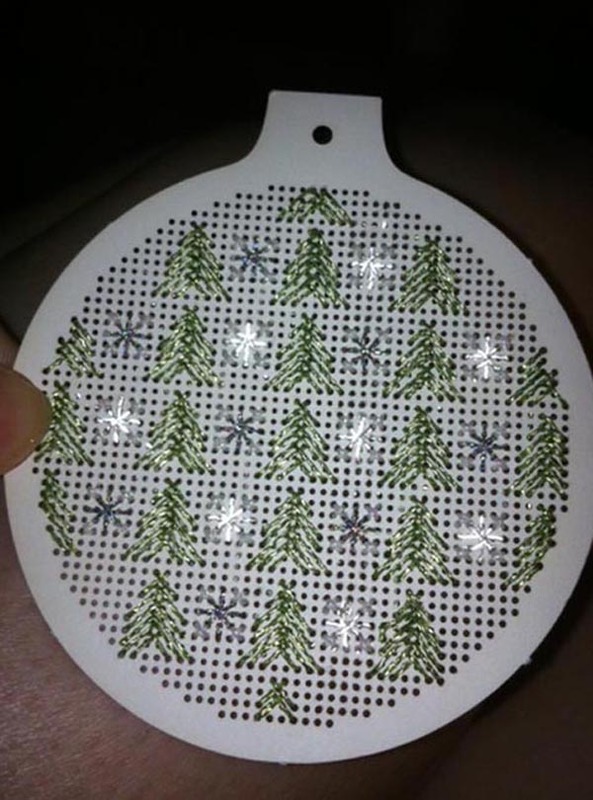 This is a fun thread to use on ornaments, because when a camera flashes (you know how we all take photos in front of the Christmas tree), the stitched stars will shine.